This is a set of 4 performance drilled & grooved brake discs to fit the vehicles listed below. They come with front and rear mintex pads. Front discs: vented 256mm diameter 4 stud. Rear discs: solid 260mm diameter 4 stud. These parts will also fit. VAUXHALL ASTRA 1.8 16V 93-98. VAUXHALL ASTRA 2.0 91-94. VAUXHALL ASTRA 2.0 16V 91-98. If your fitment is not listed, check our other items and our shop. MTEC Brakes discs can be supplied in drilled and grooved, grooved only, dimpled and grooved or drilled only, all at the same price! Key Benefits of MTEC Discs. The grooves help deglaze the pad and prevent fade which occurs when the pad and disc gets too hot! The holes help to keep the discs cool and dissipate heat! The grooves also help to channel water away from the disc surface! They add the finishing touch behind alloys! No modifications needed to fit! 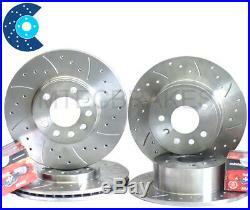 The item "ASTRA GSi mk3 Performance BRAKE DISCS Front Rear & Pads" is in sale since Tuesday, March 3, 2009. This item is in the category "Vehicle Parts & Accessories\Car Parts\Brakes & Brake Parts\Brake Discs". The seller is "mtec100" and is located in uk. This item can be shipped worldwide.